The launch of new book ‘The Economics of Arrival: ideas for a grown-up economy’ by Katherine Trebeck and Jeremy Williams this month provided a great opportunity for WEAll Scotland to engage with the public on how to create a wellbeing economy by putting on launch events in collaboration with Oxfam Scotland. Sold-out audiences in Glasgow and Edinburgh listened to an inspiring talk by the authors on the idea of ‘Arrival’ – the point at which economies can stop focusing on growth and instead focus on how to make ourselves at home in this place of plenty. The concepts in the book resonated with participants, who were full of questions and ideas. 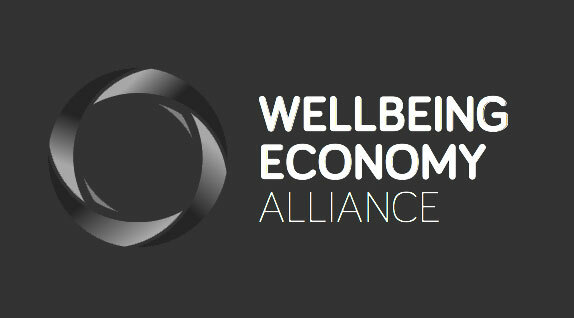 Can Scotland follow in New Zealand’s footsteps and create a wellbeing budget? What can Scottish businesses do right now to contribute to this agenda? From a local councillor, what can councils do to encourage more participation? And, from the youngest participant who was just 9 years old, how can we make sustainable solutions more affordable for everyone? 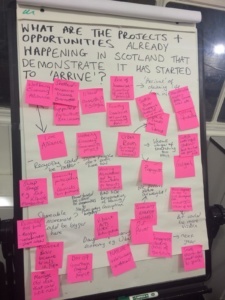 All these questions and more were discussed in interactive sessions after the talks, with people contributing ideas and solutions for how Scotland can become a ‘grown-up economy’. 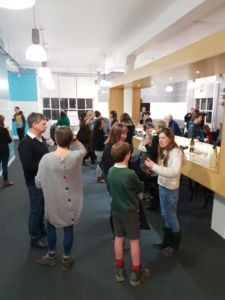 As with previous WEAll Scotland events, the diversity of perspectives in the room was very encouraging, with not only politicians, activists and business people taking part but also citizens who are increasingly concerned about the current system and keen to contribute to making change. Another, a student at Edinburgh University, said that the event and the connections with people there helped him feel hopeful for the future at a time when it seems like there’s a lot of cause for despair. ‘Arrival’ is the idea that a society collectively has the means for this. Growth has reached a point at which a decent standard of living could, theoretically, be universal – and countries like Scotland could lead the way. This week’s events certainly helped the WEAll Scotland team feel like this is not only possible, but already starting to happen. The book is available from Policy Press here.